! This guide was written using R version 3.5.1 on Windows 10. R has built in functions which allow you to interact with the host operating system, extending the functionality of R, by allowing you to execute any system command from the R console. One application of this, is opening files from the R console. Why might this be useful you may be wondering? Well, lets say you have just created a file in R (such as a saving plot as a pdf, or a writing a csv file of your data frame) and you want to check that the file was created properly, or you want to see how your plot turned out. After writing the file, you might typically fire up explorer (or finder, or files) to hunt down your creation to open it up. But this involves several mouse clicks and takes time! Instead, you could just write a simple line of code. 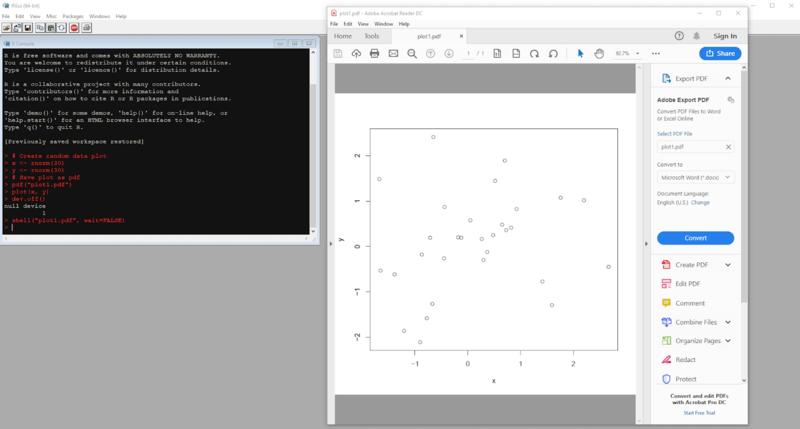 The way you do this depends on your operating system, and for these examples, we'll create a plot, save it as a pdf, then open it directly from the R console. 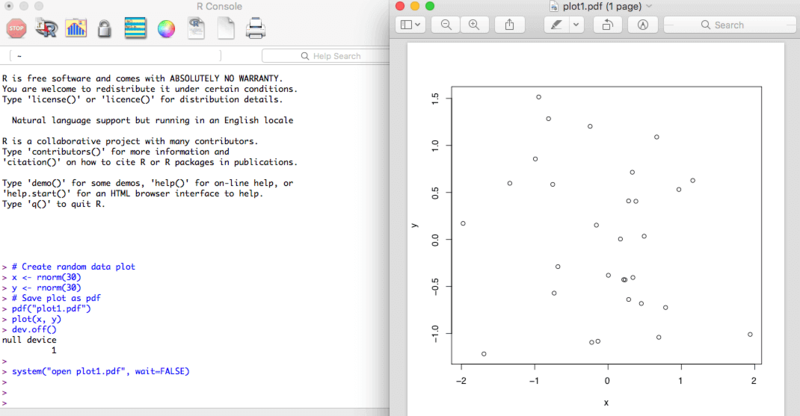 This code will create a pdf containing the plot called "plot1.pdf", which will be saved the current R working directory. To open the file from R, check out the relevant section for your operating system. The additional argument wait=FALSE tells R not to wait for you to interact with the R console - i.e. it will carry on with whatever it is doing. If you omit this argument (the default value is TRUE), R will stop executing commands until you interact with the console. The code above assumes the file you want to open is located within the current R working directory. If the file is located elsewhere, you need to tell R where to find it. Remember that you need to use forward slashes instead of back slashes for Windows file locations in R.
On MacOS, the command to open a file is "open", which will open the specified file using the default program for that file type. On most Linux distributions the universal command for opening a file is "xdg-open", which will open the specified file using the default program for that file type. Check your system documentation if this command does not work. Simple eh? Opening files in R just became much easier! Of course the shell and system functions can be used for other system commands - and you should check the help files for these functions if you want to learn more. Thanks for reading, please leave any commends or feedback below.